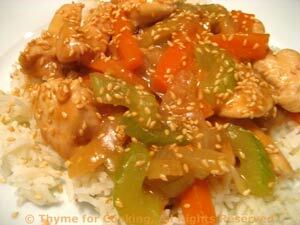 Thyme for Cooking easy recipes: Sesame Chicken Stir-Fry. A quick stir-fry to end the week and clean out the fridge. If you have any bits of broccoli or mushrooms, add those as well. Even if you don't regularly eat peanut butter, it's a good pantry staple, as we use it through-out the year.